China’s defense ministry has announced new naval drills with Russia to be held for eight days beginning August 20. Spokesperson Yang Yujun said the exercises will be held in Peter the Great Bay, an inlet in the Sea of Japan near the China-Russia border. 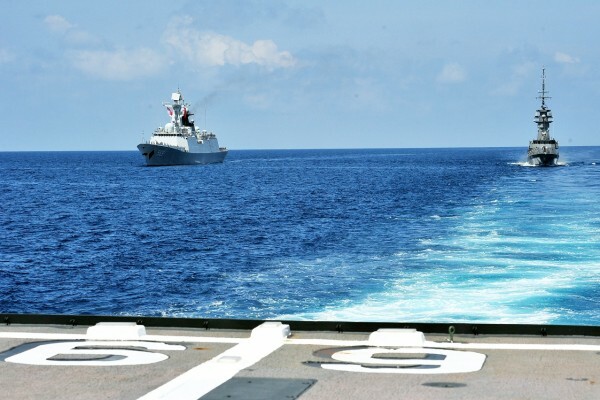 The drills, which follow a similar joint exercise in the Mediterranean in May, are designed to “to improve China and Russia’s capacity in coping with maritime security threats,” Yang said. The announcement comes amid tension between Beijing and Washington about China’s claimed jurisdiction over about 2 million square kms of the 3.55 million square kms South China Sea territory. On Friday, Yang accused the US of double standards regarding its criticism of China’s construction projects on a series of islands in the South China sea. He said that the Pentagon has been frequently sending aircraft and ships in a bid to carry out close-distance reconnaissance in the South China Sea. “The US side disregards and distorts the facts and plays up China’s military threat to sow discord between China and the littoral states in the South China Sea. We firmly oppose such actions,” Yang said. “The Chinese side expresses its serious concern over US activities to militarize the South China Sea region,” he said. China, the Philippines, Vietnam and other nations lay contesting claims to these waters, but Beijing exercises jurisdiction. On July 14, 2015, China reiterated its position of not participating in the South China Sea arbitration process initiated by Philippines at the Hague-based Tribunal.